Duck Down Records, have been coming with that fire this fourth quarter and their latest addition to the team, Ruste Juxx, has not let them down. Executive Produced by Sean Price, his protege, Ruste Juxx has been making a name for himself, on wax and on these internet streets. 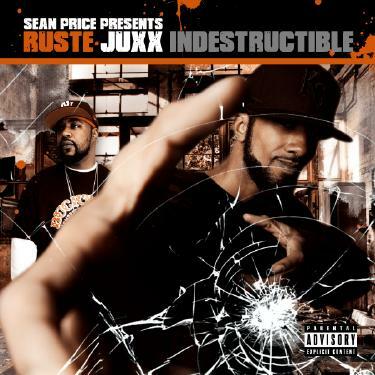 His appearances on Boot Camp Clik’s Casualties of War, Sean Price’s Monkey Barz and Jesus Price Superstar, plus touring the states and Europe on the Duck Down Roster have proved Ruste Juxx can hold a mic along side Hip Hop Royalty, but could he handle an album on his own? His debut album Indestructible starts off with classic BROOKLYN Duck Down style anthems for the streets [Wipe Off Ya Smile, Grave Digga, Morgue Truck, System On Blast] with Production from PF Cuttin, Masse Salazar and Black Milk. Lyrically Ruste Juxx style is aggressive with less concentration on one-liners, more so on delivery and flow. It works for him. on the latter half of the album, his ability to story tell shines on more soulful tracks [Love Is Worth Waiting For]. Production by Blastah Beatz and DJ Large bring this out of him. Guest appearances are minimal and include, Reek, Blaze, L.A.W.Lil Vic and Jahdan. The track that stood out to me was Blaze My Fire, a somber eulogy in memory of his sister Blaze who was also a rapper.